Retreat: Health club, steam room and sauna. 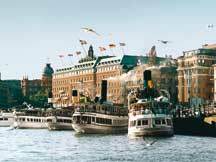 Rich in history and tradition, Grand Hôtel Stockholm dates back to 1874 and occupies prime position on the city’s waterfront. 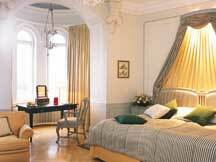 A timeless classic, it has played a pivotal role in shaping Stockholm as the cosmopolitan city that it is today. The relationship between Grand Hôtel and Stockholm is one that is symbiotic; both revel in their duality: traditional and forward looking, worldly and innocent. One of Scandinavia’s leading luxury hotels, Grand Hôtel Stockholm has borne witness to some of the world’s greatest achievements and to this day continues to makes its presence felt far beyond its shores. Since 1901, the Nobel Prize laureates and their families have all been guests of Grand Hôtel and the list of royalty, heads of state and artists who have stayed is impressive. The Grand is one of the top Europeans Conference Hotels with 23 conference and banquetting rooms in a historic, classic interior. The hotel’s interiors are held to be of such great historical significance that they have been designated as a “Swedish National Treasure”, notably the Hall of Mirrors, the Winter Garden as well as a number of the other original function rooms. To match this exclusive environment the Grand Hôtel houses a number of top restaurants, where the Veranda with its traditional Swedish Smörgåsbord is a highlight for the international guests.